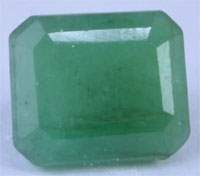 Emerald gemstone is a green and transparent gemstone of the highest rank, second in value only to Ruby. Out of the seven colours of the rainbow, it emits green cosmic rays and used to empower planet Mercury. It governs the intellect and the wisdom. It is exalted in Virgo. Communications and movement is represented by the planet Mercury for which it is worn. It ensures success to persons in trade connected with money, banking and-financial business, cashiers, accounts, shares, stock market, publishers, bank officials, chartered accountants, company secretary, computer programmers, tax collectors, lawyer, journalists, newspapers magnets, diplomats, scientists, astrologers, teachers, architects medical personalities, doctors, businessmen, property dealers, publishers, accountants, engineers, writers, post officers, insurance officers and intellectuals. It isht lord is Goddess of learning, Saraswati, who sharpens the intellect of students, singers, dancers, and musicians by Her grace on those who wear it. It is considered by many to be the stone of prophecy. For some it acts as a tranquilizer for a troubled mind. It is said to bring the wearer reason and wisdom. Lucky for love, give your lover this to stay faithful. In several cultures it was the symbol for fertilizing rain. In the Christian faith it is the symbol of faith and hope. In Sanskrit and ancient texts, it is called as Haridraratna, Marakat, and Somya. In Persian, it is known as Jarmurad. a) Persons born in Gemini, Virgo, Leo or Libra ascendant may wear it if Mercury is well placed in the horoscope but is retrograde, weak or afflicted or conjoined or aspected by malefics or debilitated. b) It will be very beneficial to those in whose chart it is lord of auspicious houses, as in the case of Taurus, Gemini, Virgo, Libra and Capricorn and to a limited scale for Leo and Aquarius Lagna, if such a Mercury is badly disposed or afflicted by malefic. It will neutralize the evil effects of such adverse influence. c) In case where Mercury is in exaltation or forms Bhadra Yoga, It gives specially good results. d)	Those in jobs connected with education publication, intellect, art of speech and voice, music, lectureship, commerce, trade, business, teaching, writing, journalism, lawyers, accounts, auditing, astrology, mathematics, science, computer, information technology, communication services e.g. P & T, railway, radio, TV, telephone, cinema, sports, travel agencies, art, artisan work, share market, banking insurance, firms and companies should wear it. e) Psychologist, psychiatrist, doctors and merchant should wear it for quick money. f) Wearing it also helps native suffering from cancer of lungs, breast, mouth and stomach, diseases of nerves, bowel, breathing, insanity, insomnia, asthma, pleurisy, meningitis, paralysis etc. g) This gem is particularly useful for students and older native since it improves memory and concentration. h) All intellectuals should wear it provided Mercury occupies quadrants and triangles, as it energizes the brain and keeps the brain cells active and fertile. If fitted in gold , it capture and tap the magical powers of Mercury in the ring itself and becomes a most effective magical charm. Newly married couple should not wear it. It as it reduces sexual hunger and passion. Combined use with red coral on Madhyama and Anamika respectively will work like magic for success in examination and competition. Substitute: Its substitute is Onyx but its weight should be twice. Aquamarine, Peridot and Kidney stone are other substitutes. If Mercury and Moon both are suitably placed in the birth chart it may be worn with Pearl. It can be worn with Pearl , Yellow Sapphire and ruby but it should not be worn with coral, gomed and cat's eye. It is worn in small finger or left hand on Wednesday morning after proper purification within 48 minutes of Sunrise. It may also be worn during Aslesha, Jyestha or Revati Nakshatra. Where is it found - It is found in granites, pegmatites and schists as well as alluvial deposits. The finest ones are from Zambia and Colombia. Other sources are Austria, India, Australia, Brazil, South Africa, Egypt, Norway, Pakistan and Zimbabwe. It is Beryllium aluminium silicate and formula is Be3AI2(Si03)5. It has hardness of 7.5, specific gravity 2.71, refractive index 1.57-1.58 with a Hexagonal crystal structure. A real gemstone if seen through Chelsia filter, it will look pink. Whereas, the fake one will remain green. Real one if rubbed with turmeric on a stone leaves a red residue. It is chemically composed to silica 67-85%, aluminia 17-95%, beryllia 12.4%, magnesia 0.9%, soda 0.07%, water 1.665 and organic matter 12%. 1. It makes the eyes cool very soon. 2. It has the power to cure all sorts of eye troubles, ear troubles, headache, forgetfulness, epilepsy, insanity, stammering, hysteria, nervous breakdown, food poisoning, hernia, hysteria, asthma and stomach disorders. 3. It saves a person from troubles, increases power of faculty, gives mental peace, pacifies the anger and increases eye sight. 4. It keeps the body health and mind happy. 5. It is uses to enhance the positive effects of mercury. 6. It influences the intelligence, education, speech, teaching, learning, communication, confidence, writing, drawing, trade, humor, wit, discrimination, diplomacy, intellect and commerce. 7. It is worn to improve business, trade and communication skills. 8. It sharpens the intellect and removes speech defects. 9. It controls nervous energy and channelises it in the right direction. 10. Skin problems and allergic conditions are improved by wearing it. 11. helps to lift depression and insomnia and promotes knowledge of the heart resulting in peaceful dreams. 12. Helps to ease labor and delivery. 13. It increases memory and intuition, . 14. it enhances body vitality, and immune system. 15. It is useful in decreasing pain, cancer, ulcers, infections, stress, paranoia, schizophrenia, radiation effects, acidity, headache, back pains, sciatica, and female diseases. rheumatism, cough stammering, spondalysis etc. Therefore, in this condition, wearing is most useful.